With the excitement of that Day 1 feeling now behind us, competition heated up on Day 2 of the Laver Cup. 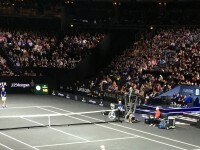 The afternoon session started at 1pm and it was a packed house at Prague’s O2 Arena as the one and only Roger Federer was kicking off the afternoon program. While Federer took a little while to get his backhand going, he reached his clinical best as he dispatched Team World’s Sam Querrey in straight sets. A gripping encounter then followed, where Nadal was pushed to the brink by Querrey’s compatriot Jack Sock. The class and experience of Nadal shone through as he took the third set match tiebreaker 11-9. By the end of the afternoon session Team Europe held a commanding 7-1 lead over Team World. While the afternoon session matches did not run as long as Day 1, to still be able to see Federer and Nadal at the top of their respective games was a privilege and no doubt is one of the key reasons why the first ever Laver Cup will be a success. With the afternoon session ending a good 2.5 hours before the evening session began, most fans left the stadium (as we weren’t permitted to hang around) and headed to the nearby fan zone. Many passed the time by sampling Czech beer, along with some local and international delicacies. Others waited in line at the sole merchandise store in the Fan Zone. The merchandise store has been under siege since Day 1 with now it seems only a few t-shirts and hats remaining, with stock of highly sought after branded towels and Wilson tennis balls nowhere to be seen. A little surprising is that there are no other sponsor tents in the fan zone, e.g. Wilson or Nike. In comparison to the merchandise availability at other tournaments, e.g. Shanghai Masters, this Laver Cup is a little light on. This may be because it is the first event and subsequent events will have a different approach. Given the lines seen at the merchandise stands, there is a clear demand for Laver Cup branded merchandise. 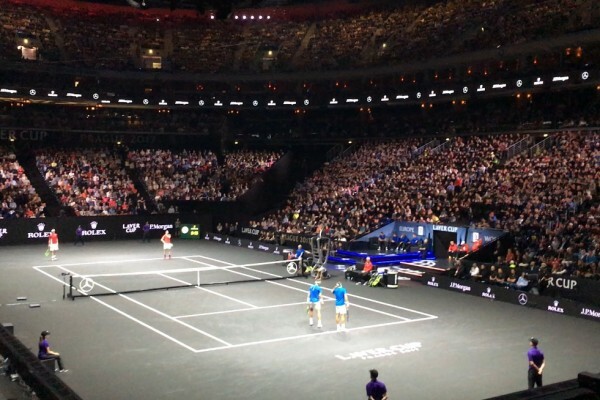 After the interlude, fans rushed back into the O2 to see local favourite Tomas Berdych take on Australia’s #1 Nick Kyrgios, followed by the much-hyped doubles pairing of Federer and Nadal. Berdych who seemingly didn’t miss a line throughout the match was on course for the win, however a quiet but strong-minded Kyrgios dug deep to win the second set tiebreaker and then seal the win in the third set match tiebreaker. The main event of the evening was then upon us as #FedalUtd came on court (Federer and Nadal) to what would have to be one of the biggest doubles crowds in recent memory. The pairing which have combined winnings (singles and doubles) of $198,240,092 thrilled the crowd as they took the match into the third set match tiebreaker and claimed victory over the American pairing of Querrey and Sock. Team Europe finished the day with a 9-3 lead over Team World. While Team Europe is in pole position to claim the inaugural Laver Cup, its unique format means that a Sunday match victory is worth three points, meaning a Team World comeback is still mathematically possible. Day 3, the final day of the Laver Cup awaits us.